We all adore our pets, and can’t imagine life without them. Sometimes, however, owning a pet can be a bit of a nuisance. We might think of our dogs or cats as a family member, but that doesn’t mean that we call a dog-sitter when we want to go on our date. For the most part, animals are fine when left alone in the house during shopping trips, date nights, and maybe even an occasional overnight stay (as long as you leave late and come home early the next morning). However, taking a vacation when you have a pet can be a real headache. First, you have to think about whether you’re leaving them at home or bringing them with you — this initial decision can be complicated enough. If you decide to leave them at home, you have to figure out how you intend to do this: will you ask a close friend or relative to dogsit? If so, do you require them to stay over at your place or just call in to feed them every day? Do you trust them enough to feed them at the right time/the right amount/fill their water bowl often enough? Is your pet friendly? Or will they be not-too-happy about your next-door-neighbour turning the key in the lock every day? If you decide to take them with you, the obvious question pertains to your mode of travel. Are you just going for a break a few hours away or flying to Australia? If you’re driving to the next state, is it suitable to bring your pet in the car? 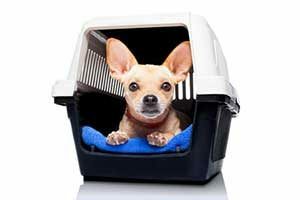 Do you have a pet crate for transport? If you’re planning a cruise, did you know that there are a few pet-friendly cruises out there? First things first: fly with your pet only if you have lots of time before the flight. We recommend starting research and preparation at least three months before your flight: particularly if you order the transport cage online as I did (online is much cheaper). You don’t need to hire a professional company to do the transport for you. The vast majority of pets will be fine being flown in their cage if properly introduced to it to build comfort and familiarity. We recommend buying the cage and having it arrive at your house at least two weeks before the flight so you can get your animal used to it by leaving it open and putting a blanket or toys in it. Some cat and dog breeds are highly strung, so it will take them a while to become comfortable with the cage, especially when you try to close the hinge. The country you’re flying from affects the veterinary care needed because different countries are prone to different diseases. The general rule is that your animal has to have injections to prevent or cure any diseases that affect them in your country of origin — not your destination. This is because the country you’re going to doesn’t want to bring a new disease into their own country, so if you come from a country that has animal diseases that are foreign to them, they require your animal to be vaccinated against it (even if they don’t have, and never had, the disease). The country you’re going to only really matters in the sense that you have to make sure your animal is vaccinated against all diseases required by that country. For example, if you’re from America and flying to Ireland, you have to get rabies shots for a pet you’re bringing on board. This is because America has rabies naturally present in animal populations and Ireland doesn’t. However, if you want to be really organized and reduce further potential stress, you may want to check out the animal diseases that occur in the country of your destination. A good way of illustrating this is by flipping the Ireland/America example the other way round. The requirements for flying dogs on a plane set for America is actually very easy: oftentimes, all you have to do is get them a general check-up to say they were in good health. This is just to cover the general regulations of any airline or airport, who want to cover themselves legally in case something happens to your animal on the flight. This has nothing to do with disease or vaccination. Get any necessary vaccinations very close to the actual flight so that they won’t expire before arriving in America. This isn’t essential for your animal to enter the destination country, but it saves the extra stress of making a vet appointment as soon as you arrive. More information on bringing your pet to the U.S. can be found on the CDC’s website. 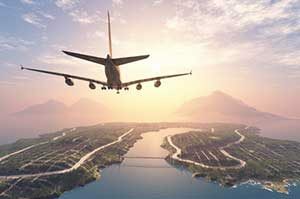 Every airline/airport have different rules and regulations pertaining to the transport of animals, so as soon as you have your flight booked you should contact the appropriate staff to find out what those specifics are. Different airlines, for example, have different requirements for the height/length/width/material of the transport mechanism for your animal. Check that the flight allows animals by consulting the airline website. Write down questions you’ll want to ask on the phone. Book your animal on board the same flight and ask the questions you wrote down. If you remember other ones later, call back when convenient. Consult the airline website for more detailed information. Next, check out the country of origin airport to see if they have any extra regulations (usually they just say to contact the airline). Finally, check the airport of the destination country to see what their animal process is. Book vet for required and optional injections/check-up, check that you have all the appropriate documentation for your animal, order the cage and train them how to use it, and make general arrangements for the day of the flight. Alternatively, you might want to opt for the easy choice and hire a pet-sitter so you can avoid the headache of this scenario altogether!